The wealthiest, and dare I say it Toriest, parts of England have actually experienced no job losses. 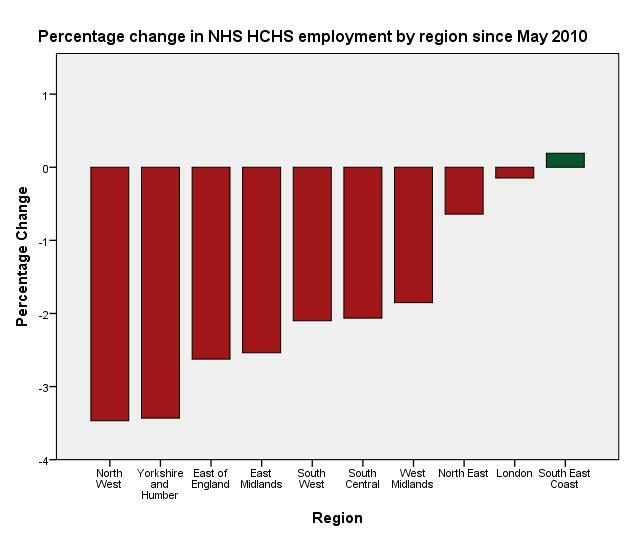 The South East of England has actually grown its NHS workforce since the May General Election, while the North West of England alone has experienced more than 6,500 job losses. His post includes a chart. Clarke’s chart shows absolute figures – I thought I’d make my own version of it, showing percentage change. This doesn’t make any real difference to the story, but here it is anyway. Note that these figures are Hospital and Community Health Service staff, excluding primary care staff – lots of NHS employment isn’t captured. Click the chart to enlarge it. Data from here. A helpful way to approach Brandom’s inferentialism is to look at some of the positions he takes it to oppose. In this post I will begin to discuss one such position, which Brandom labels ‘reliabilism’. Nevertheless, Brandom believes that representation should be understood in social terms. What does this mean? We can start to unpack this by contrasting Brandom’s position with a common alternative account of reference, which Brandom (following standard philosophical usage) labels ‘reliabilism’. The issue here, of course, is how we gain empirical knowledge of the world – we are interested for now in language-entry moves (perception), rather than language-exit moves (action). Recall, then, that Brandom’s account is built up out of reliable differential responsive dispositions (RDRDs). RDRDs are the basic (if you like ‘ontological’) building blocks of Brandom’s account. [Though this is a ‘weak’ rather than a ‘strong’ ontology, in that it does not make any claims about the ‘fundamental’ entities that inhabit our world; merely the kinds of behaviour some entities in our world must be capable of exhibiting if our account is to have any explanatory function.] Given this, it would seem to make sense for Brandom’s system to take reliability of responsiveness to stimuli as the core of its account of representation. It is generally agreed that some sort of entitlement to a claim is required for it to be a candidate for expressing knowledge. But it is not obvious that inferring in the sense of justifying is at all fundamental to that sort of entitlement. The core point, it appears, is that our beliefs cannot be accidental if they are to be capable of counting as justified. A belief formed by flipping a coin will not (unless, perhaps, we attribute the coin-flip’s outcome to the intervention of a supernatural power) provide justified belief even if (by chance) it provides true belief. An account is needed of the non-fortuitous formation of a belief if it is to be a candidate for knowledge. [T]he correctness of the belief is not merely fortuitous if it is the outcome of a generally reliable belief-forming mechanism. Epistemological reliabilists claim that this is the sort of entitlement status that must be attributed (besides the status of being a true belief) for attributions of knowledge. Brandom makes use of Alvin Goldman’s ‘Barn Facade County’ thought experiment (from Goldman’s “Discrimination and Perceptual Knowledge”, Journal of Philosophy 73, no. 20 (1976)) to argue against the reliabilist position. I’ll talk about this next. Brandom’s system is an ‘inferentialist’ one. Brandom frames much of his work by contrasting this ‘inferentialism’ with what he calls ‘representationalism’. These are two different approaches to understanding conceptual content. ‘Representationalism’ is the view that representation should be taken as explanatorily fundamental for semantics. On this picture, certain linguistic units have meanings by virtue of their powers to denote, or refer. These units can then be connected and combined in propositional structures or belief-webs, the subsections of which can be connected by chains of inference. This is the picture of language proposed by Bertrand Russell, and by the early analytic philosophers working within the logistic paradigm Russell popularised within the English-language discipline. There are simple units of reference, which can be combined and manipulated by using fundamental logical tools of inference. Inference is explanatorily basic, also, on this account – inference cannot be explained in terms of reference. But reference likewise cannot be explained in terms of other semantic concepts. ‘Inferentialism’, by contrast, takes inference as explanatorily fundamental. Furthermore – and seemingly implausibly – it suggests that representation can be explained in terms of inference. On this inferentialist picture, inferences do not connect independently-comprehensible representational content-units. Representations can only be understood – and can be fully explained – as products of inferences. Weak inferentialism is the claim that inferential articulation is a necessary aspect of conceptual content. Strong inferentialism is the claim that broadly inferential articulation is sufficient to determine conceptual content (including its referential dimension). Hyperinferentialism is the claim that narrowly inferential content is sufficient to determine conceptual content. Broadly inferential articulation is sufficient to determine conceptual content. Broadly inferential articulation includes as inferential the relation even between circumstances and consequences of application, even when one or the other is noninferential (as with observable and immediately practical concepts), since in applying any concept one implicitly endorses the propriety of the inference from its circumstances to its consequences of application. Narrowly inferential articulation is restricted to what Sellars calls “language-language” moves, that is, to the relation between propositional contents. Brandom presents here a ‘web of belief’ picture, in which propositional contents are related inferentially. Proposition A implies proposition B, and both are incompatible with proposition C, etc. If we understand propositional contents in linguistic terms – propositions being things that can be expressed in sentences – then we can think of the inferential relationships between propositions as relationships between specific linguistic contents. An inference is a “language-language” move, in that it connects one linguistic content to another linguistic content. depicts our empirical thinking as engaged in with no rational constraint, but only causal influence, from outside… Coherentist rhetoric suggests images of confinement within the sphere of thinking, as opposed to being in touch with something outside it. Brandom too regards this as the likely penalty of a hyperinferentialist understanding of conceptual content. Such an understanding, Brandom claims, may be plausible “at most for some abstract mathematical concepts” (AR, p. 220). It is, however, an inadequate explanatory apparatus if we aspire to treat the empirical richness of most conceptual content. Weak inferentialism, by contrast, suggests that while inferential connections between propositional contents are a necessary component of our explanation of conceptual content (a concept cannot have content if nothing follows from that content), an account of inference cannot be sufficient to fully explain conceptual content: some other category – i.e. reference – must be brought in to account for the (rational) connection between words (or propositional contents) and things. What is the nature of the ‘strong inferentialism’ Brandom advocates, which aims to chart a course between these two alternatives? Another way of putting this: what is the category of ‘broad inference’ that encompasses more than simply language-language moves under the heading of inference, for Brandom? The important Chapter 4 of Making It Explicit addresses these issues. There Brandom discusses ‘Perception and Action’ – or, as he also terms then, ‘language-entry’ and ‘language-exit’ moves. Language-entry moves (perceptions) allow things outside of linguistic practice (the regular furniture of our world) to impinge upon, influence, generate and destroy the conceptual contents we manipulate in our thoughts and statements – to have a bearing upon which conceptual contents are warranted, and which are not. Language-exit moves, by contrast, allow our concepts to impact upon the world in more thoroughgoing ways than via the usual articulation of sentences or interaction of brain-behaviours – we act and transform the world in ways that are connected to our beliefs, and the justification or otherwise of these actions is connected to the content of those beliefs. How can these perceptions and actions be folded within an ‘inferentialist’ account of conceptual content? In what sense should the perception of a moving rock, or the action of kicking one, be understood ‘inferentially’?